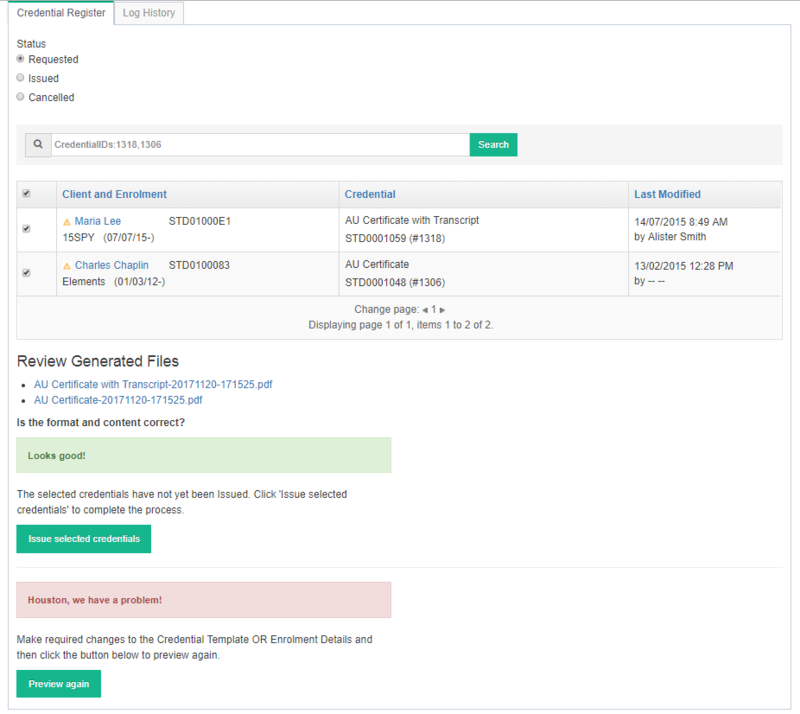 Generating a Credential is achieved using the uReport feature. It uses the generic Credential template document to format and input required Credential information. If this is the first time your company is generating Credentials we recommend to first test the process using our generic templates. Then once confident with the process you can create you custom templates for live situations. Note: If you already have your Course Enrolments set up, go to Step 2. 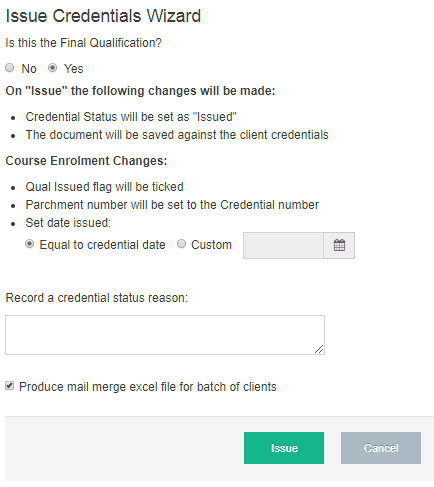 A Credential will only generate when a Course Enrolment exists and, depending on the Credential Template it may also need to have Unit Enrolments with appropriate Outcomes. This is because some Credential Templates are designed to only show competent Unit Enrolments. It is important to have all appropriate fields that will be inputted into your Credential to be correctly set up against the Learner and Course Enrolment. Note: For the purpose of testing you could create a dummy Course Offer and Enrolments. Fill out the relevant details (the fields that are greyed out will be automatically populated). If you wish to generate the credentials immediately – tick the check box for Go to qReport Credential Register when complete? During the Issue process there are two options; Preview and Issue. Note: Issued Credentials CANNOT be deleted so we highly recommend you preview before issuing. Note: This step is only available for user with an LRM Admin role. Follow either the Preview or Issue steps. If after Previewing you are ready to Issue, Click Issue selected credentials and follow Issue instructions. Note: If your Credential is not showing correctly? Check out the specific Credential FAQ page to learn more before you issue your credentials. 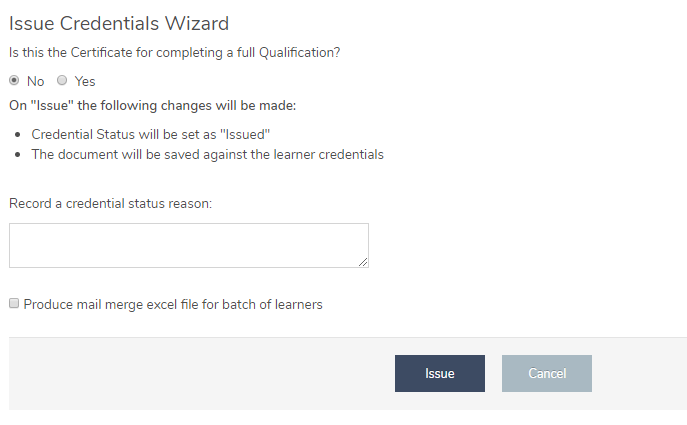 Select Yes or No, Is this the Certificate for completion a full Qualification? Note: If you have any issues during uReport generation then please use the following troubleshooting guide to see how to resolve them. A print version is generated which combines all of the selected credentials in a single PDF. On the 1st of each month, all Log History files more than 7 days old are deleted. However, this does NOT affect the Credential Register or PDF copies of credentials stored against Learner records. The Credential Register of all issued credentials is still preserved and maintained against each client’s enrolment. You can use Reports 0323 and 0411 to obtain the full Credential Register.